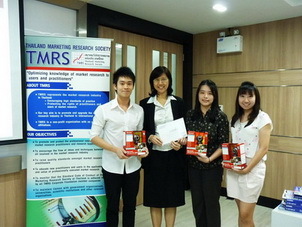 Having realized this fact, we decided to participate in the program called �TMRS Young Marketing Research Program� of which the aim was to extend knowledge of marketing research, and to promote young marketing researchers. We were at first required to complete the test and submit the essays to the selection committee. Once qualified to join the real 5-day session during October 11-15 2010 held at <?xml:namespace prefix = st1 ns = "urn:schemas-microsoft-com:office:smarttags" />Thammasat University, we were intensively trained by several well-experienced marketing researchers from research companies. We really appreciated the opportunity to be equipped with knowledge in this field and practical research techniques. Posted date: October 28, 2010 � 13:10 hrs.